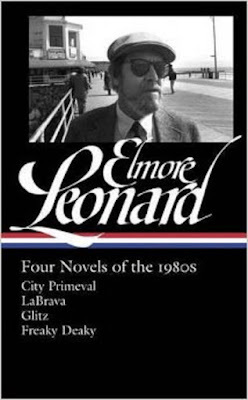 I've been a huge admirer of the late, great Elmore Leonard since the early 1980s and the first two Leonard crime novels I read - City Primeval and LaBrava - appear in the new collection of four of his novels from the 1980s. Veteran journalist and author Joseph C. Goulden offers a good review of Elmore Leonard: Four Novels of the 1980s in the Washington Times. Library of America is performing a stellar service to the legions of readers who admire the crime-thriller writer Elmore Leonard (and include me in those ranks). At hand is the second volume of a planned trilogy that brings back four of the master’s best novels. And they vividly display Leonard’s talent for sparkling stories — ranging from an elaborate scam involving an aging movie star to the search for an assassin in glitzy Atlantic City. Leonard, who died in 2013, created a legacy that surpasses even such masters as Dashiell Hammett and Raymond Chandler. Leonard began writing when he lived in Detroit, and his first novels delved into the underworld of that gritty, tortured city. My first exposure to Leonard convinced me that he must be an ex-convict, given his mastery of thug-speak (“Jack City” for the Michigan state prison) and a seeming insider-knowledge of how to rob a liquor store and roar away on a motorcycle. Wrong. In “real life” Leonard toiled as a copywriter for an advertising agency, and — very importantly — he had the work ethic essential to anyone serious about becoming a writer. He would arise at 5 a.m. and write for two hours before making breakfast for his two kids. As he once put it, “I had a rule that I had to write a page before I put the water on for the coffee.” At work, he kept a legal pad in his middle desk drawer on which he would write in longhand when alone. His first works were Westerns, when that genre was still popular with magazine and book publishers. When he wished to describe a desert or canyon he turned to a magazine, Arizona Highways, for guidance. Then he shifted to crime, in a city where the cops were tough and the criminals even tougher.